I Wish You A Merry QAL…Done! The weather has been cold and wet all day. The Christmas music has been playing. Since I will not be able to work on projects tomorrow, I went ahead and finished piecing the Christmas QAL. It will be some time before I can get it to my friend to longarm, but that’s okay. Joining the QAL was a fun experience for me. The designers provided creative and challenging blocks. The star block kicked my bottom. Someday, I will make another attempt to piece this star. I substituted three blocks from the QAL with blocks that I thought added a personal touch to my quilt. I loved seeing the different interpretations of the same block from all over the world. It was enjoyable to see and have conversations with all these people on Facebook. I have been working on this quilt since August, and this is the longest it has ever taken me to finish a product. It is nice to have ongoing projects. These last few days of working on this quilt has brought back many memories of Christmas Past. Thanks to all the creative people involved in this QAL. Thank you, Abbie , for extending the invitation to join this group. Abbie, your Christmas quilt is beautiful…so bright and cheery. You may not be able to see the “tinsel” effect on the sashing. I thought it added a Christmas touch. The high today was 45 degrees! It has also been raining. So, it was the perfect day to wear my Grinch slippers, lounge in my new snuggly purple robe, read, listen to Christmas music, and work on my Christmas QAL. I pieced the back with 12″inch blocks made from remnants of fabric used in the quilt, plus some other Christmas fabric. As I took the picture, I realized there is a corner of red blocks. I was thinking of changing it…but maybe I won’t. The color of red in this picture looks more pink. But the color is really in the range of cherry red to cranberry red. I placed the string of lights on the back. Thanks for all the input on my question about the layout of the front blocks. One of the cool perks that comes with blogging is learning from others. Sometimes, it just takes the artistic eye and expertise of someone else to help me get through a creative block. I appreciate all of your input. The consensus of the Facebook QAL group and blogger response was the lantern block. I originally did not like the way the lantern turned out, but after I made some changes, I was leaning towards using the lantern. It seemed to fit better, even though it was the only block with a border. I pieced all of the vertical sashing; but I only completed two rows of the horizontal sashing. As I was taking this photo, I realized that there are two gold and white squares too close to each other. Other than this mistake, I am happy with the way it is turning out. Tomorrow I will decide if I am going to make changes to what I have. Then, I hope to finish the sashing and add the keyboard border. It is going down to 36 degrees tomorrow! Block #12, by Laura Piland was so much fun. Of course, my string of lights came out a bit twisted, with the lights on the inside instead of the outside of the string. I also had to make the bulbs a bit smaller so they could fit. I needed a red background to add balance to my quilt, but the red sort of interferes with the red bulbs. I also figured out how to make a stocking quilt block. So, now I have to figure out which blocks will be included in the quilt and which ones become a pillow cover. I thought that maybe the string of lights could be one of the blocks I piece on the back. So far, 2 out of 3 family members chose the quilt with the lantern. Blocks 10 (lantern) and 11 (star) are not my best blocks. I don’t know if my lack of enthusiasm is because this QAL has gone on a bit longer than my nano-second attention span; or if I am too busy thinking of and making other projects. The QAL has been fun, and I have learned some new skills. So, I met my two goals for joining the group. 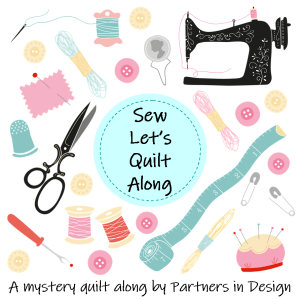 I also discovered a new community of quilters through Facebook. Another plus is the number of creative people with whom I have been able to connect through blogs. These two blocks (10,11) need to be revisited and improved before I add them to a quilt. Today, I spent time cutting and piecing the keyboard borders out of the Christmas remnants. I also cut the 4 large corner squares, and 16 end squares for the sash. Tomorrow is craft day with the Meemaws, so I might not get to cut the sash until Friday. Wednesday is our walk in Wimberley, Texas…can’t wait for this one. When choosing fabric for a project, I sometimes think and rethink the matter. Then, I usually end up not being satisfied with the final choice, and find myself returning to my first impulse choice. Every time I passed my design wall, my eye ran directly to Block 8, the two gifts. Not only did the green border bother me, but also, the fact that edge of one of the gifts was at the wrong angle, just didn’t sit well with me. I could live with the ribbon segments being a bit off, but not the gift edge. The dark solid green is pretty, and it will be used on another block, I am sure. But it just did not suit Block 8. Should I start over or try to redo the red and green gifts? I decided to try to salvage the red and green gifts and I ripped the green background pieces. I pulled out my Christmas fabric, and went back to my first choice for the background fabric. The beige and gold fabric, with red and green holly, was the fabric that I had originally planned to use. After I ripped the gifts and added the new fabric edges, I had to make minor adjustments to the size of the gifts. In order to get a 12.5″ block, I added a bit of a border on the sides, and a fourth more to each of the top and bottom border. Next time I choose fabric, I will go with my instinct and go with the flow. This QAL has been so much fun. I chose a red, green, and gold for my palette…reminds me of my childhood traditional Christmas. Block 7, the Poinsettia, was easy to complete. I say easy, even though I had a few rips and re-do’s. I almost chose not to do Block 8, designed by AliceSamuelQuiltCompany. The two gift block design is beautiful, and the directions were specific and informational. I just thought it would be too difficult. But then, I remembered I joined this QAL to challenge myself and learn new things. So, I put on my big girl pants and gave it a go. The two gifts remind me of what my mother would say she wanted for Christmas…just Peace, Harmony, and maybe a lipstick. These are her gifts, minus the lipstick. After a few rip and re-do’s, the ribbon piece is still a bit off on both of the gifts, but it will have to do. There are just so many rips and re-do’s allowed in one day. I also redid Block 6, the angel. I chose to make an angel different from the one in the pattern. Originally, I had framed the angel in white, and it just washed out. So, I chose a green fabric for the frame. I placed all eight blocks on my design wall. My friends and I started our walking group today. We were scheduled to begin last week, but we were rained out. Today was just a gorgeous day for a walk through part of the downtown area. My childhood home was a bit south of downtown San Antonio. My elementary and high school years were in downtown schools. Today’s walk brought back so many memories of my childhood in downtown San Antonio. Our group started off at the Pearl Brewery. The parents of one of my childhood friend worked at the Pearl when it was a brewery. Now, the buildings and area house retail stores, eateries, and the Culinary Institute of America. We traveled down the river walk to the Southwest School of Art. This was once a convent and academy for girls, founded in 1851. This is one of the courtyards. This is the Fountain of Peace. It gave me some ideas for a project. I have taken art courses at this center, and today, we went to visit a friend who is taking a weaving class at the center. She introduced us to other weavers and we were able to see their beautiful work. Our friend has just begun a project. I love the way she works…no plan. She chooses the yarn and creates as she goes. Her thread design board is sitting on the window. We confirmed her choice of thread to add to the weave she has in progress. This school of fish suspended beneath the interstate overpass, is the work of artist, Donald Lipski. This is one of the water fountains near the brewery, but I did not catch the name or the artist. Throughout the morning walk, I kept pointing out things that I thought would be a great quilt. My friends were kind enough to put up with me. This early morning walk was truly a blessing for the whole day. I visited the Mesquite Bean Fabric Shop on my way home. Yes, I bought some fabric. I had to use my 20% discount. I needed a bit more fabric for my I Wish You a Merry QAL. Block 8 has two gift boxes. At first, I thought this block was too difficult, and I was going to make a different type of gift block. But then, I decided to take the challenge. One of the reasons I chose to do the QAL was to learn new things. It entailed about three rip and redos, and the seams for the ribbon piece are still a bit off. I am letting it sit for awhile, before I get back to it. Ribbons on gift boxes aren’t perfect…right? I was so happy to get the two pattern blocks for the QAL. Today, I was only able to do Block #7 by SandyStarDesign. Everything seemed to fall in place, and I was so proud of finishing it. When I went to take a photo, something just felt wrong. I kept looking at the pattern…then my block…and finally figured out that I had placed the center squares in the wrong direction. This of course, threw the whole poinsettia off. After taking a brisk walk, I came back and ripped the whole thing apart.